At Technology Park Function Centre we offer a choice of 7 different training rooms that can cater to a small 3 or 4 person workshop right up to a 200 person conference making it an ideal location to host your next staff or client training session. Our rooms are extremely versatile and can be setup to your exact requirements and feature quality audio visual equipment, high-speed fibre optic internet, whiteboards, flipcharts, notepads and pens. La Mint Cafe our onsite caterer can provide you with an extensive range of delicious menus for breakfast, morning and afternoon tea right up to lunch and dinner. Coffee is freshly brewed from a special “Five Senses” blend. For your training days, we give you the option of providing your clients with a choice of five different team building activities that are fast paced, fun and can be completed within 15 minutes. Laughter with purpose breaks up the day to make it a more enjoyable experience for your function’s attendees. 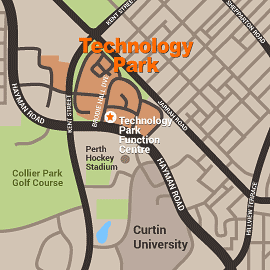 Technology Park Function Centre is conveniently located close to the Perth CBD in a lush and tranquil parkland environment with free parking available for up to 150 cars. Our staff are dedicated to making sure your training goes smoothly and on time.